The word miracle has been so overused (from the “Miracle Mets” to Miracle Whip) that it’s hard to know how to describe real miracles—like the ones taking place in China today. To help us understand some of the astounding developments in modern China, Christian History spoke with Kim—Kwong Chan, co-author with Alan Hunter ofProtestantism in Contemporary China (Cambridge, 1994). One prominent missiologist calls this volume “the best book on the current scene.” No wonder: Chan, as a free-lance consultant, has traveled extensively in the interior of China and visited dozens of churches. In his current project, he is seeking to find effective mission models where mission activities are officially prohibited. How is Hudson Taylor remembered in China today? He is not well remembered. Average people of China have little knowledge of the history of Christian missions. When the government speaks about the missions movement, it emphasizes its faults. Many Protestant missionaries felt superior to the Chinese; some were even racist. Some exploited the Chinese. Those memories trigger resentment among the Chinese, even among Chinese Christians. So even believers don’t talk about the early missionaries. I travel to different Christian communities in China, and most of them have virtually no linkage, structurally or historically, with mission societies. How do these Christians explain their faith? They know foreign missionaries brought the gospel to China, but their evaluation of the missionaries is ambiguous at best. Christian missionaries, they believe, were often the agents of Western imperialism. Then again, in spite of their imperialism, they brought the gospel to China. Are the charges of imperialism and ethnocentrism justified? Yes, but we must remember that people in any age find it extremely difficult to detach themselves from their history and culture. Even today, in spite of the lessons of history, I see churches and mission societies extend their own denominational values and their own culture as they spread their message. It’s hard not to do so. Many China missions were criticized for “bribing” the Chinese with food (usually rice), education, or hospital care to get them to listen to the gospel. The resulting believers were sometimes called “rice Christians.” But recently I've visited Asian mission societies in outer Mongolia; as villagers entered one worship service, they were given two kilograms of rice and a bottle of oil. It’s hard to learn from history. By 1949, less than a million Protestant Christians could be counted (about.2 percent of the population), and this after over a century of intense missionary work. Was this work, then, a failure? A little less than a million believers is not bad, but the percentage is low. Yet we have to remember that from 1911 to 1949, China was continuously at war—civil war and at war with Japan. Famines and other natural disasters repeatedly swept through the country. China was in constant turmoil and social chaos for almost half a century. That instability prevented normal church growth. What happened to Chinese Christians after 1950, after the expulsion of the missionaries? Until recently, the church remained relatively static. In 1950, if you include Roman Catholics, there were about 4 million Christians (3 million Catholics and 1 million Protestants) in China. In 1982, according to the government, there were 3 million Protestants and about 3 million Catholics. I suspect another million or more could be counted if you add “secret Christians,” those who were never baptized but were believers in all other ways. The church grew slightly faster than the growth of the general population, which doubled during that time. Was this relatively static state due to government persecution? Yes. From 1949 to 1980, hostility was directed against Christians and other so-called “bad elements” of society, including intellectuals. People lost their jobs, others were thrown into jail, others still were sent to labor camps. Christians were second-class citizens, and that affected not just individuals but their families and relatives, as well. During persecution, many Christians stopped going to church. Many churches closed. But the church didn’t shrink, it just went underground into what have been called “family churches,” which originally were gatherings of Christians related by blood. Many Chinese Christians just didn’t publicly acknowledge their faith, but they transmitted it to their children and sometimes, at great risk, to friends. We often read that the church exploded in growth during these persecutions. Is that not true? The explosive growth came after the mid-1980s, when the Chinese government relaxed its attitude toward Christians. Some of the immediate growth, perhaps 1 to 2 million, came because underground Christians went public with their faith. But since the mid-1980s, the number of Christians has grown to somewhere between 20 to 30 million (even 50 million as some have claimed, although I have serious reservations). In any case, it has been phenomenal. But it has happened after the period of persecution. Why is the Chinese church growing so rapidly at this time? First, there is an ideological vacuum in China. People no longer claim loyalty to any kind of faith, not even to communism. Because of the more open policy of the Chinese government, there is more contact with the Western world, and people are fascinated by different ways of thinking, including other religions. Religious fervor has been high the past ten years, and Christianity has benefited most. It’s something novel to most Chinese, but also something Western, modern, and rational. Second, Christianity provides people with an intimate social experience: love, caring, concern, and fellowship. They can reveal themselves to others because of the trusting relationships they have with other Christians. After a long, repressive era in which you didn’t dare reveal what you really felt and thought, this is an exciting option for many Chinese. Third, there are the miracles. When I travel to the interior of China, the Christian communities all claim they've seen and experienced miracles. One typical example: An old Christian woman in one village decided, after her eightieth birthday, to start preaching the gospel. She went to the village where her daughter lived and began to preach there. Some villagers who had been afflicted with various incurable diseases, like cancer, came to this woman. When she prayed for them, many were suddenly healed. Then two more people came to ask for healing, and she prayed, and they were healed. Then three more families. After this woman left, these villagers decided her God was very good. So they abandoned their idols and decided to believe in this Jesus. After that, a new church was started. I hear such stories all the time in my travels. How do the local government officials react? That’s another interesting set of stories I hear. People tell me that if local officials try to harass Christians, many of them get strange diseases. In one case, I was told that the local communist party boss couldn’t speak any longer because his tongue got stuck out; he couldn’t put his tongue back into his mouth again. After he repented and became a Christian, suddenly his tongue moved, and he could speak again. Afterwards, more people became Christians. I don’t know if such instances are psychosomatic; I haven’t followed up to confirm each story. But I hear these kind of testimonies in most of the villages I enter. What is the difference between the family churches and the official Three-Self Church? Actually there isn’t much difference any more. In the early 1980s, some Christians attended official Three-Self congregations (self-government, self-support, self-propagation—meaning, free from foreign missionary control). These churches were given government licenses to operate and were overseen by government officials. Other Christians worshipped in family churches, or family gatherings, because they resented government oversight. During these years, you chose to participate in one or the other, and a lot of suspicion between the two groups was in the air. Today the distinctions are breaking down. A number of Three-Self clergy also pastor family gatherings. A number of family gatherings are informally sanctioned by the government. This is especially true in rural areas. In some towns, family gatherings have grown beyond extended relatives. Some have large church buildings and command the loyalty of the majority of the town’s inhabitants. The local government can’t ignore them just because they don’t officially exist. Sometimes they are invited to village councils, along with Three-Self representatives, to help plan civic events. What are the prospects for Christianity in China today? Comparatively speaking, religious groups have far more freedom today than they did 100 years ago. Kim-Kwong Chan is co-author with Alan Hunter of Protestantism in Contemporary China (Cambridge, 1994). What do you pack if you’re going to China as a British missionary in 1865? 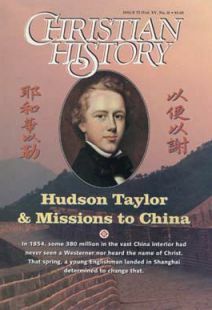 Resources for those interested in learning more about Hudson Taylor and Chinese missions.